Instagram recently introduced a new “Close Friends” feature and this blog post you will find out what is it and how to add friends to the list. From last few months, Instagram has introduced lots of new handy features to fancy their users. Ever update for videos and photos sharing service has something new for users — this time its Close Friends. The company was testing this feature from June 2017, and after 18 months of testing, Close friends list feature is available for people all across the globe. The purpose of the feature is to offer users more control over privacy so that they can share Instagram stories with a limited number of followers who’re very close to them. What are Instagram Close Friends? Instagram new Close Friends feature lets users create a circle of close friends. The users can select to whom they want to add into their close friend’s list. 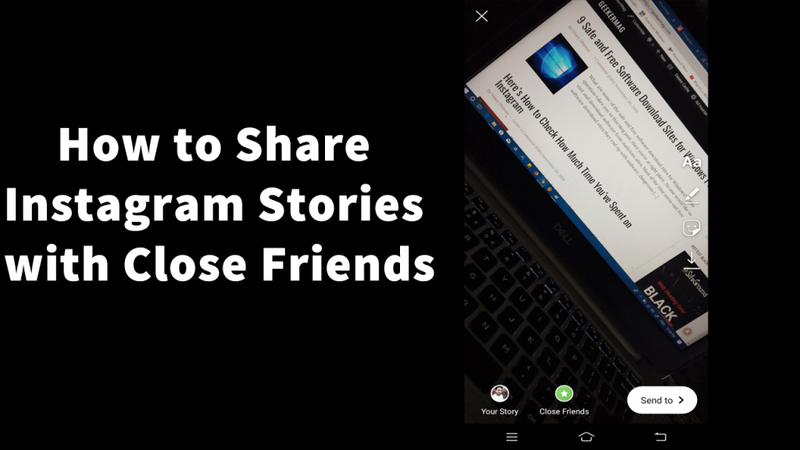 After creating the inner circle, you can share Instagram Stories only with them. 1. You need to download and install the latest version of Instagram. 2. To use this feature, you need to launch Instagram Storie’s camera and take a picture and video. 3. Next, you will see a Close friend icon (Green color circle having star in it) at the bottom; you need to tap on it. 4. This will take you to Close friend list screen. Here you will get a list of all the friends you’re following with Add button next to every name. Add the people to your Instagram inner circle. Instagram will suggest the name of the people depending on how much you interact with them. Also, there is a search box available in which you can type the name to find the people. 5. After adding people to your Close friend list, you can switch to Your Friends tab to find out people you have added into the inner circle. In case, you have mistakenly added the people into the Inner circle, then tap on the Remove button next to the name to remove the particular people from the list. 6. Once you’re done with adding people to your Close friend’s list, tap on the Done available on the upper right corner. 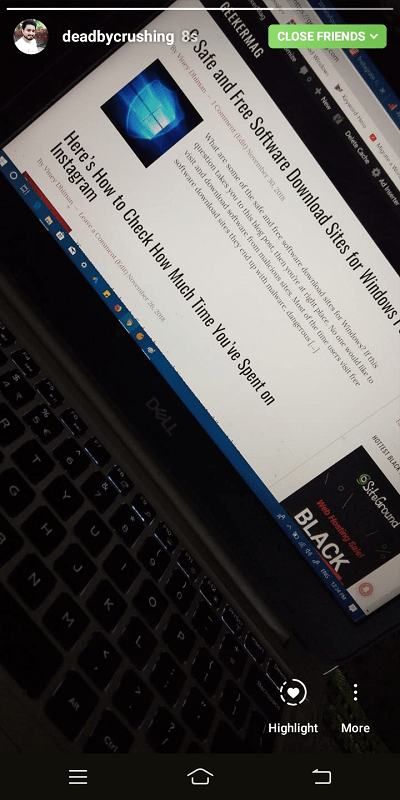 This will save the list and take back to Stories screen. 7. To share the Instagram story with your Close friends, tap on the same green star icon. Once you share the story with your inner circle, there will be a green color ring instead of pink-purple gradient rings. This gives an idea to other users that you’re part of uploader’s Close friend circle. Also, there will be Close friend listed on the upper right corner. You can tap on it to find out who else in the list. Tap on the Profile icon available on the bottom right side. This will take you to Instagram profile. Next, tap on the Hamburger icon available on the upper right corner. This will open the Navigation Drawer, select Close Friends. Add or remove the people from the list and tap on the Done option to save the list. That’s all about Instagram Close Friends feature. Find this feature handy? 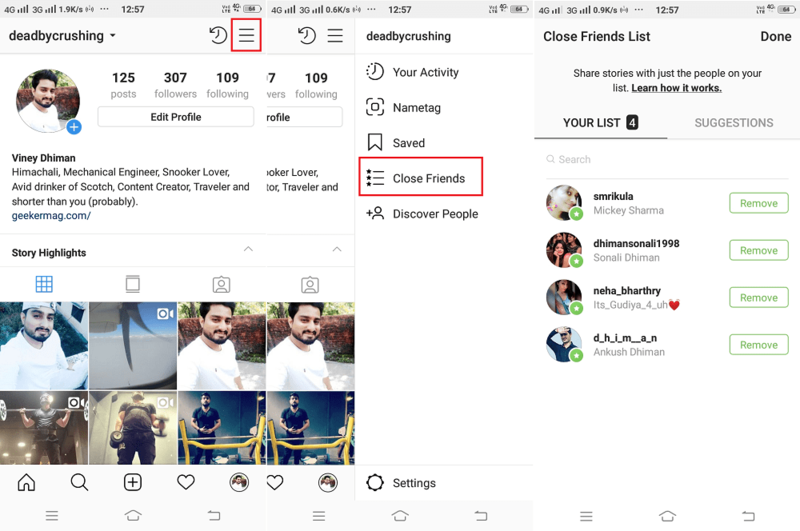 What are your thoughts about Close Friends feature of Instagram? Feel free to share your thoughts in the comments.